Occupy the Airwaves is back! We produced another 16 hours of women on the radio for International Women’s Day 2018 in collaboration with Phonic.FM Exeter’s Community Radio and Exeter Phoenix Arts Centre. This year we thought and talked a lot about women and their activism, inspired by our Rebellious Sounds Archive and about the centenary of the first votes for some women as a catalyst for the content for programmes. We were thrilled to have WREN music live in the studio singing songs from their Herstory projects and then a bigger choir who sang to us in the Workshop space at Exeter Pheonix. Thank you so much to WREN music and their team and all the women who sang. In the workshop space artwork was shared and exhibited all day by women involved in Dreadnought projects; Rebellious Sounds Banner making and Rebellious Threads. Knitting for peace took place and many people dropped in for a conversation. Thanks to all who did. Thanks to all our Trustees who supported us. To Kerrie Seymour and Nicci Wonnacott who led on the exhibition work and encouraged participation across the day. To Michelle Ridings for all your contributions to the day. To all our hosts and guests. To Mary Culhane for documenting all the wonderful things going on via social media. AND finally a massive thank you to Helen Connole a Director of Phonic.fm who drove the desk for most of the day and supported us technically. We wouldn’t have been able to do it without you. To Real Food Store, Herbies, Emma’s Bread and Ben Cottam for providing sustenance for us on the day. Most generous and gratefully received by all. 2330–0000: Wrapping Up with Lande Hekt and rest of Dreadnought Team. 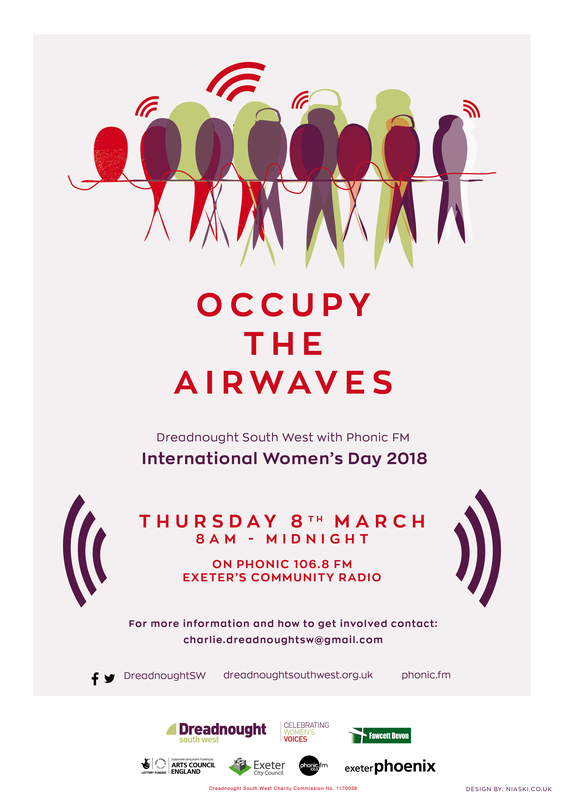 Occupy the Airwaves 2018 is funded by Exeter City Council’s Small Arts Grants Fund, supported by Exeter Phoenix Arts Centre and Phonic FM, Exeter’s Community Radio.